Getting and keeping the attention of customers at a tradeshow can be tough. Your competition is probably sitting right next door or just across the aisle, and they’re trying to do the same thing as you – pull the customers in and make a sale. With everyone focused on the same goal, and probably selling similar products, you need to stand out. That’s where tradeshow graphics and signage comes in. How you present yourself has to be unique and spectacular! Studies show that you have exactly 1.6 to 1.8 seconds to wow passersby at a tradeshow. That’s how much time they need to decide whether to visit your booth or move on to the competition. It doesn’t matter how awesome your products and services are, or how knowledgeable you are in the field – it’s going to be your graphics that pull people in so you can seal the deal. There’s a lot that goes on at a tradeshow, and the experience can be somewhat over-stimulating for some folks. When it comes to tradeshow graphics, sometimes less is more. Now, we’re not saying you should have a simple white banner with text. We all know there are already plenty of THOSE in the world. No, what we’re saying is that rather than displaying flashy graphics and a ton of photos that make people’s eyes glaze over, sometimes simple elegance is a better way to go. We here at Pike Graphics understand the nature of the tradeshow. We know how fierce the competition is and how finicky customers can be when so many choices are available to them. We know you have to stand out from the crowd, and we can make that happen. Our team of designers have the knowledge and talent to create stellar tradeshow graphics that not only look great, but draw the customers in – imagine helping customer after customer at your booth while your competitors watch in awe as they twiddle their thumbs. THAT is what having awesome tradeshow graphics can do! Pike Graphics uses the latest technology to create tradeshow graphics that are sure to bring the customers to your booth. We add that “wow” factor that gets you noticed. Let us worry about getting the customers to your booth. You just worry about how you’re going to handle all that potential business that comes in. 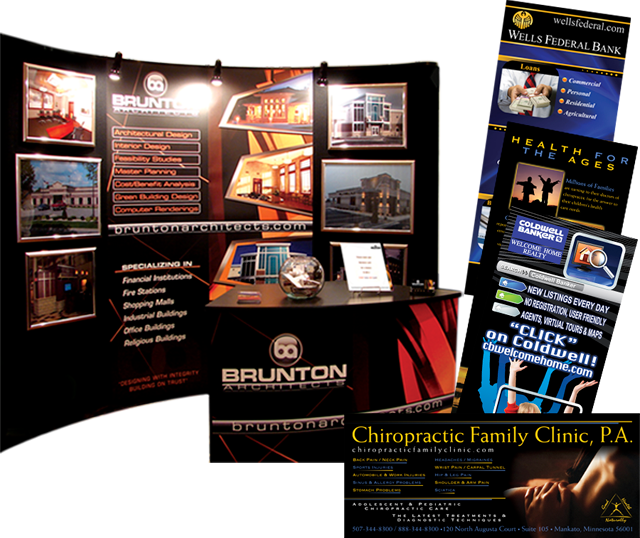 Contact us today for more information on creating stellar tradeshow graphics for your next show.